​Exact repetition of a motif or phrase is a technique found in almost all traditional and popular music. Often the second repetition varies the ending of motive slightly. Repetition of a motive or phrase establishes symmetry within a melody. Repetition unifies a melody. Successful melodies often have a motive or phrase that serves as the “hook” for the composition. These often define the piece and are always repeated. 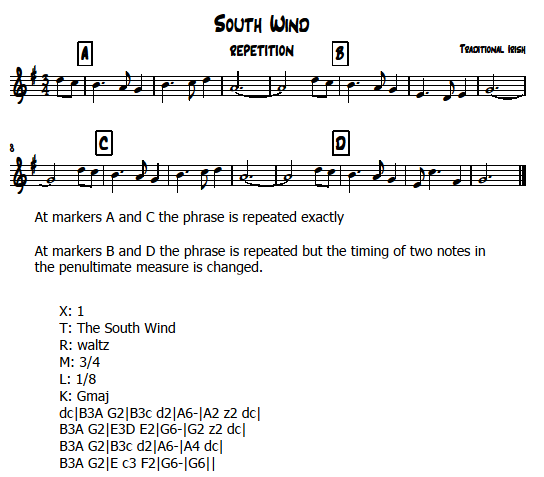 A clear example of the repetition development technique is the Irish waltz South Wind. Look at the score below to see that the A part of the tune is really only two phrases. Each is repeated once. The same structure is present in the B part of the melody. ​The audio file is Irish Wind from my CD 12 Degrees of Separation. The track opens with South Wind. That tune is followed by two other Irish dance tunes: Wind that Shakes the Barley and Spring Wind. The South Wind portion of the track is played on solo bouzouki and then uillean pipes. Listen for repeated phrases in South Wind. Then listen to the remaining two dance tunes. See if you can identify the phrase repetition in these tunes. 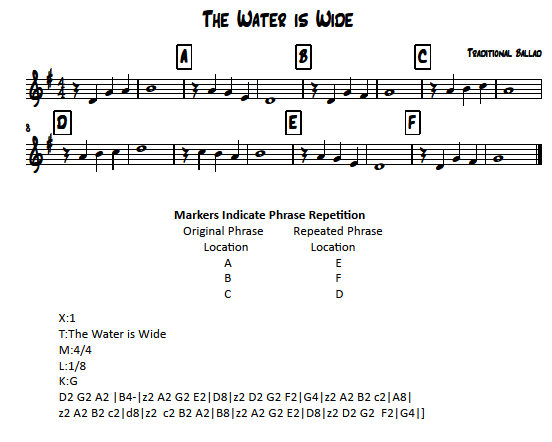 ​The traditional ballad The Water is Wide is sixteen bars long. Three phrases are repeated filling out six of the measures in the piece. Eight measures contain only whole notes. A pick up measure at the beginning and a transitional measure between markers D and E account for the remaining two measures. So, this tune is really three phrases, six whole notes and two transitional or pick up phrases. A clear demonstration of the power of repetition as a development technique.